Voice over Internet Protocol (VoIP) technology seamlessly routes voice conversations over your hospital wireless network to ensure immediate, real-time connection to highly mobile hospital staff throughout your campus — and beyond. By promoting better, faster communication and collaboration, wireless VoIP can help improve quality of patient care, increase staff productivity, and potentially reduce costs. A secure and redundant wireless LAN provides the critical foundation for an effective hospital wireless VoIP system. Speed and bandwidth of the existing or upgraded wireless LAN must be tested and proved sufficient to support VoIP. QoS refers to the ability to prioritize different types of traffic on an IP network. With VoIP, this means assuring that voice traffic receives a higher level of priority to ensure it will not be delayed or dropped. The hospital wireless network infrastructure must be able to support applications that depend on multicast, such as videoconferencing. With patient lives hanging in the balance, hospitals have zero tolerance for system failure, especially the inability to communicate. Backup controllers and servers and uninterrupted power supply sources are standards for hospital wireless VoIP. Most hospital staff members are constantly on the move during their shifts. Such mobility makes it difficult to reach them via traditional fixed phone systems, which tend to function as voice message centers rather than two-way communication tools. With wireless VoIP, clinicians can be reached immediately, wherever they are, eliminating the need to waste valuable time tracking people down and waiting for callbacks. Wireless VoIP frees medical personnel to provide quality care wherever necessary throughout the hospital, since they no longer need to be tied to a specific workstation to make or receive calls. Plus, leveraging the hospital wireless network to make and receive calls eliminates the frustration of dropped calls or poor signal strength that a reliance on cell phone carriers often brings. 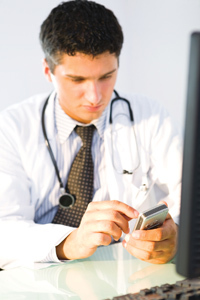 What are the needs for your hosptial wireless network? Contact us today for a free consultation or download our free wireless wireless design guide. Next Post: What does the cloud and smart phones mean to wireless networking?